Can US-Vietnam reconciliation hurt Moscow’s ties with Hanoi? U.S. President Barack Obama’s trip to Vietnam and lifting of the arms embargo will no doubt boost bilateral relations. But for Hanoi it is still a rebalance, not a pivot, as Vietnam still has a strong reliance on Russian military exports. Earlier this week, in a farewell trip to Asia, U.S. President Barack Obama concluded a visit to Vietnam. It was literally a roaring success. The people in the streets of Hanoi and Ho Chi Minh City greeted the President with flags and welcoming posters and the audience in the National Convention Center burst into applause at every strong statement, hearty reference or joke that Obama uttered during his address. The kicker of the trip was, of course, the lifting of the U.S. arms embargo on Vietnam, perhaps the strongest reminder of the Vietnam War, which still haunts bilateral relations in the form of Agent Orange contamination and unexploded ordnance in Vietnam and a large anti-Communist Vietnamese diaspora in the U.S. By fully removing the arms trade ban, the U.S. Administration has helped the two countries to turn the page and finally speak of properly normalized relations. But it is more than that. Obama is busy with his legacy-building, and it could not be a better way to round up his Asia-Pacific “rebalance” than with a trip to the number one “new” partner in Asia (Vietnam) as well as the number one “old” partner in Asia (Japan). Coincidentally – or perhaps not – both of them are active members of the Trans-Pacific Partnership (TPP), widely seen as the economic fulcrum of Obama’s “rebalance” project. From Vietnam’s perspective, the burgeoning relations with the U.S. are even a bigger deal. Having suffered from bloc politics dearly, the Vietnamese have developed a certain kind of political thinking, where independence is top priority and can only be achieved by balancing partnerships with global and regional powers. Pitching the country’s stable political system, strong military, strategic position, and a vibrant and promising economy to various global and regional players, the Vietnamese leadership is aiming to diversify its foreign policy. South Korea brings Foreign Direct Investment (FDI). Japan brings Official Development Assistance (ODA). The EU brings technology. Russia brings military equipment, and energy technology, including nuclear, oil and gas projects. The U.S. brings its huge market for textiles and agriculture, as well as geopolitical support. China brings an ideological alliance and trade. China is a special case, of course. The kind of love-hate relationship Vietnam has with China goes way back in history. Geographically, there is no alternative to China as the closest strategic partner. The relationship between the two Communist parties is very strong and Vietnam’s policies are often based on lessons from the China relationship. China is Vietnam’s largest trade partner and the two countries share a strong connection with traditional Confucian political culture. At the same time, the Vietnamese live in constant concern over perceived sovereignty threats, especially in the South China Sea. Moreover, Vietnam is experiencing a huge and further growing trade deficit with China, which threatens to make the former dependent on the latter. As Vietnam has been gaining momentum of economic growth, lifting itself out of poverty and straight into the league of developing powerhouses, the country’s elite is trying to balance out China. There is no getting away from the big northern neighbor, but the Vietnamese could certainly use a better hand when dealing with the Chinese and make this relationship more beneficial if they have stronger partnerships with the U.S., Japan, ASEAN countries and Russia. Russia, in turn, is an important factor in Vietnam’s external ties. The ongoing sales of Russian frigates, submarines, missiles, and air defense systems are precisely what gives Vietnam the ability to leave China with a proverbial bloody nose in case there is an actual military clash in the South China Sea. Moreover, the high status of the Russia-Vietnam political relationship is also supposed to hold China back, leaving Beijing reluctant to threaten its ties with Moscow. At least this was true when the U.S. arms embargo was in place. So will this change? Not immediately, that is for sure. Arms procurement strategies do not change overnight, and with Russia’s dominant position on the Vietnamese arms market, it is likely to remain the leader over the coming decade. The U.S. may occupy certain niches, especially high-tech, like maritime surveillance, or perhaps coast guard ships and transport airplanes. But Russia will remain the key seller of all the hard-hitting weaponry. What are the implications for Russia then? U.S.-Vietnam relations are developing at a very fast pace. 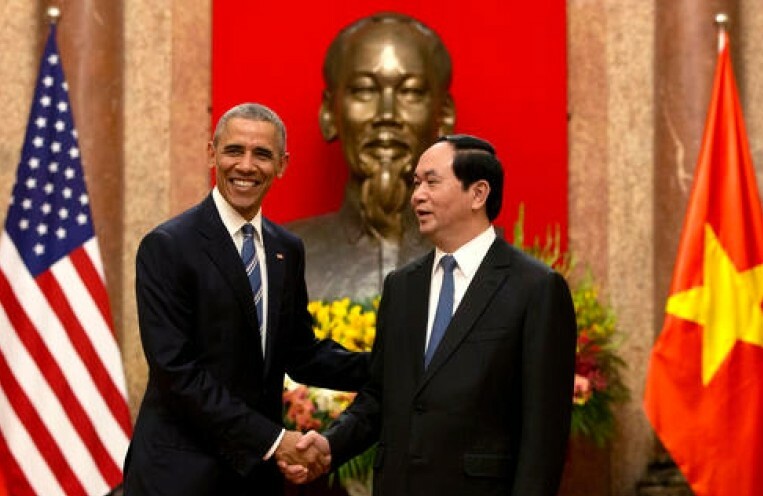 In 2015 Barack Obama received the general secretary of the Communist Party of Vietnam, Nguyen Phu Trong, at the White House, essentially acknowledging that socialist rule is not an impediment to bilateral ties. This time, Obama chose not to tie the arms embargo to Vietnam’s progress on human rights, once again signaling that U.S. geopolitical and economic interests in Vietnam are more important than promotion of liberal democracy there. This trend will no doubt continue if tensions rise in the Asia-Pacific region. This is why Russia’s role in Vietnamese foreign policy will likely face a relative decline, at least if current trends prevail. The strong military connection dates back to a time when Russia was the only strong partner for Vietnam. Now things are different – when China, the U.S., Japan, India, South Korea and the EU are all making plays for Vietnam, it is illogical to assume that Russia’s posture could continue to be as strong as it is currently. Fundamental changes in the way how Russia and Vietnam cooperate have to happen to change the nature of their relations. So, Russia has to keep in mind that gaining momentum is the only way not to fall behind. Anton Tsvetov is the Media and Government Relations Manager at the Russian International Affairs Council (RIAC), a Moscow-based foreign policy think-tank. He also has a blog at Russia Beyond the Headlines.